The Office of the Provost established the Quaker Studies Working Group in 2018. The Working Group supports the Academic Study of Quakerism at Haverford College. 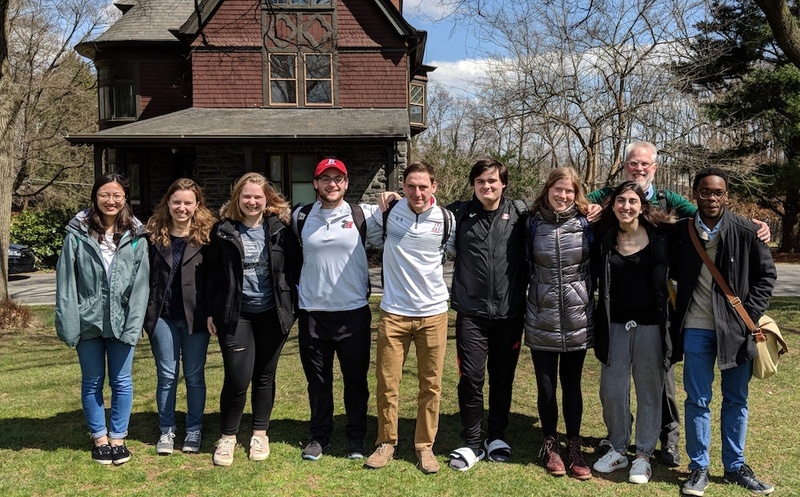 Students from the “Reinventing Quakerism” course visit the house on campus Rufus Jones lived in for much of his life. The field of Quaker Studies encompasses a wide variety of methodologies: history, literary studies, anthropology, sociology, gender studies, religious studies, and visual studies, for example. Scholars who work in the field sometimes approach Quakerism with a good deal of skepticism. The range of questions that scholars in Quakers Studies ask is almost identical to the range of questions asked by scholars who focus on other religious, cultural, social and political phenomena. Quakerism has attracted scholars’ interest for a very long time, and it figures prominently in classic scholarly explorations of religion such as James’s Varieties of Religious Experience, (which was published in 1902). But Quaker Studies as it is practiced at Haverford is a young field: it did not really begin to coalesce until the 1990s. Richard C. Allen and Rosemary Moore, eds. The Quakers, 1656-1723: The Evolution of an Alternative Community. University Park, PA: The Pennsylvania State University Press, 2018. Stephen W. Angell and Pink Dandelion, eds. The Cambridge Companion to Quakerism. Cambridge, UK: Cambridge University Press, 2018. Michael Birkel. Quakers Reading Mystics. Leiden, Netherlands: Brill Research Perspectives, 2018. C. Wess Daniels, Robynne Rogers Healey, and Jon Kershner, eds. Quaker Studies, An Overview: The Current State of the Field. Leiden, Netherlands: Brill Research Perspectives, 2018. Jennifer Graber. The Gods of Indian Country: Religion and the Struggle for the American West. New York: Oxford University Press, 2018. Nancy A. Hewitt. Radical Friend: Amy Kirby Post and Her Activist Worlds. Chapel Hill: The University of North Carolina Press, 2018. H. Larry Ingle. Nixon’s First Cover-Up: The Religious Life of a Quaker President. Columbia, MO: University of Missouri Press, 2015. Jon R. Kershner. John Woolman and the Government of Christ. New York: Oxford University Press, 2018. Marcus Rediker. The Fearless Benjamin Lay: The Quaker Dwarf Who Became the First Revolutionary Abolitionist. New York: Beacon Press, 2017. Michele Lise Tarter and Catie Gill, eds. New Critical Studies on Early Quaker Women, 1650-1800. New York: Oxford University Press, 2018.